"A smoothly automated dance of saws, claws and conveyor belts" - That's the title of this week's 'good news' story showing our industry in a positive light and covered by our friends in the mainstream media - for Stuff news. We all know how easy it is for our industry and people to be portrayed poorly to the rest of the news- reading population, so when it's good coverage we need to see it as well. Enjoy! A sawmill tucked away in a forested corner near Blenheim is not so quietly producing a large chunk of the timber used for the country's houses, decks, fences and furniture. Kaituna Sawmill, owned by Nelson Forests, turns about 1.2 million cubic metres of raw logs into 55,000 cubic metres of high-grade, market-ready timber each year. About half is sold domestically, while a quarter each goes to Australia and countries consuming more timber than they produce. 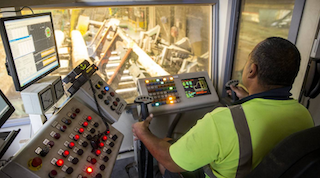 The journey from tree to timber is not the dangerous, strenuous job it once was, but a smoothly automated dance of saws, claws and conveyer belts, supervised by people in high-vis, hard hats and earmuffs.